Barrel aging is a lot of fun, and really isn’t that much more challenging than using a carboy or bucket (if you have the space for it). After three beers each aged for a year each in our first barrel, which previously held bourbon at A. Smith Bowman, the oak and spirit characters it once imparted are now almost completely depleted. It could certainly continue to age beers that benefit from a lighter touch of oak, but we thought it would be more fun to start over with a fresh barrel from the same distillery (originally we were hoping to score a port barrel from a local vineyard, but their timing didn’t match with ours). We do not rinse, burn a sulfur wick, or otherwise clean or sanitize the barrel before filling. The most important thing to do is have the beer ready to go into the barrel as quickly as possible after the barrel is emptied. If you obtain a barrel which previously held wine or beer and are not able to fill it within a couple days, then it would be a good idea to rinse the barrel. If you need to hold the barrel for longer than a couple weeks, then you should consider either burning a sulfur wick or filling with a holding solution composed of water, citric acid, and metabisulfite. Your goal is to prevent the growth of microbes like Acetobacter and mold which can cause off-flavors. Spirit barrels are safer for longer (which is good since burning a sulfur wick in one can have explosive consequences), but they too will eventually dry out which can cause them to leak when finally filled. For the closure, previously we have used standard #10½ rubber bungs affixed with water-filled airlocks. However, after recently talking to Vinnie of Russian River, I picked up a couple of these that convert between waterless airlocks to solid silicone bungs. It will be nice not to worry about a dry airlock allowing a free flow of oxygen into the beer (virtually guaranteeing acetic acid production). Since we were starting over with a clean barrel, we thought it was a good opportunity to also pitch a new culture. The previous barrel had a resident culture that produced a wonderful, mostly lactic, sourness and did not completely dry out the base beer. The character shares a lot of similarities with beers from Raccoon Lodge, where they pitch their sour beers with a house strain of Lactobacillus in the absence of Brett. Nathan is planning to use our retired barrel to help start his barrel program at the brewpub where he'll be brewing, Right Proper. Most of the oud bruin we transferred out of the old barrel went into bottles, but as usual some people put part of their shares onto fruit. I moved one of my two shares (4.5 gallons) onto 2 lbs of sour cherries, Nathan went with raspberries, and Alex is considering peaches or pumpkin. One of the most enjoyable parts of these barrel days is getting to try variations on the beers that other people have done previously. This time Jeff brought both cherry and raspberry versions of the wine barrel aged Belgian single, both of which were very nice. For the new barrel we wanted to pair the vanilla and coconut aromatics we got in the first beer aged in the original barrel with the cherry-pie aromatics of the Brett lambicus strain from Wyeast (the White Labs version of the strain is much funkier, and would not meld as well). To support the bold character of the fresh barrel the six of us agreed on an oatmeal barley wine recipe that included a hefty dose of crystal malt. Since we are not pitching lactic acid bacteria, we were able to add more hop bitterness than we would want in a truly sour beer. For subsequent fills we may pitch additional microbes transitioning to sour beers, but it will be another year before we have to make that decision. For the primary fermentation on my 10 gallon share I didn’t have enough ale yeast to pitch, so I augmented it with some lager yeast. As strange as an ale-temperature lager yeast fermentation may sound for a barley wine, it is actually how Thomas Hardy’s Ale is produced according to Barley Wine. When I tasted my portion of the beer after primary fermentation was complete it had a slightly fruity character (along with big caramel), but otherwise tasted unremarkable. On top of that, the Brett will both destroy and create esters, making the primary fermentation character far less important than it would be in a clean beer. 3.01 oz. Crystal (Whole, 6.15% AA) @ 70 min. 1.00 oz. Simcoe (Pellet, 12.00% AA) @ 70 min. 1.00 Unit Whirlfloc @ 15 min. Brewed 2/20/12 Used a blend of several medium to dark crystal malts including CaraMunich, CaraVienna, Valley Malting Dark, Simpsons Dark, and Golden Naked Oats. Collected 9 gallons at 1.102 with a batch sparge. Collected 3 extra gallons of final runnings and boiled those separately for 20 minutes. Chilled to 70 F, shook to aerate, and pitched a blend of rehydrated US-05, S-23, and a passed its best by White Labs Southern German Lager. Left at 63 F, good fermentation by 24 hours. At that point I moved it to the basement to restrain the lager yeast from getting too fruity. 3/22/12 Kegged, flushed with CO2, sealed. 3/25/12 Racked into new bourbon barrel. Alex made 5 gallons with Wyeast Brett lambicus (WY5526) that will serve to get the rest of the batch going. The barrel was about 3 gallons short of being full. Wow, thanks for the link to the bung! Those look great. I think racking onto pumpkin gives a bigger flavor, although it takes a lot if you really want a squash flavor. Not a bad idea to have it in there for a few months, and give it a rouse a few times during aging. 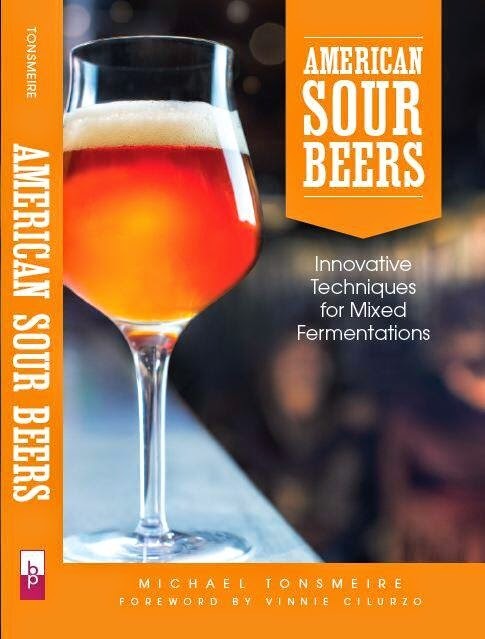 Love this blog - has been a great learning resource for me as I learn and expand my brewing knowledge. Curious - what size barrel is this? If my math is right - around 20 gallons? I was in touch with a local (Finger Lakes Region) winery, but they only had 55 gal barrels, which is more than I can envision filling. Not sure what your math was based on, but it was a standard 53 gallon bourbon barrel. 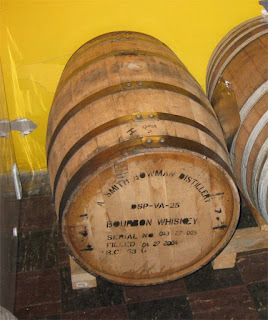 The advantage of these regular barrels is that their prices are often lower than smaller barrels, this one was only $70, and I recently heard a distiller was selling 8 gallon barrels for $140. It certainly takes a group to fill, but that only adds to the fun. I'll keep my eyes open. 8 gallons would be okay, but if I could find something in the 15-30 gal range, that'd be ideal for me. That is, if they're actually made in those sizes.. There are certainly smaller barrels. See if there are any nano-distillers around you. I know in Virginia there is one that does rye in 30 gallon barrels. Thanks again for such a great resource. Loved reading about your experience with Scott at East End. I used to live in Regent Square and frequented the brewery. Good guy, creative, risk-taker. I'm sure you're aware of his expansion in progress. Great to see good things happening to good folk. Anyways - I'll certainly show some tangible support by picking up your book once it comes out! It was a lot of fun going out there. Just talked to Dan at Beaver Brewing about his Kvass (flavored with lemons and open fermented), should be an interesting chapter. Still in the barrel... sounds like it may not pull through. We all got too busy and didn't have a chance to pull it when it was in a good place.